Digital business has been driving the transformation of underlying information technology (IT) infrastructure to be more efficient, secure, adaptive, and integrated. IT must be able to handle the explosive growth of mobile clients and employees. It also must be able to process enormous amounts of data to provide deep and real-time insights to help achieve the greatest business impact. This IBM® Redbooks® publication addresses the new IBM z Systems™ single frame, the IBM z13s server. IBM z Systems servers are the trusted enterprise platform for integrating data, transactions, and insight. A data-centric infrastructure must always be available with a 99.999% or better availability, have flawless data integrity, and be secured from misuse. It needs to be an integrated infrastructure that can support new applications. It also needs to have integrated capabilities that can provide new mobile capabilities with real-time analytics delivered by a secure cloud infrastructure. IBM z13s servers are designed with improved scalability, performance, security, resiliency, availability, and virtualization. The superscalar design allows z13s servers to deliver a record level of capacity over the prior single frame z Systems server. In its maximum configuration, the z13s server is powered by up to 20 client characterizable microprocessors (cores) running at 4.3 GHz. This configuration can run more than 18,000 millions of instructions per second (MIPS) and up to 4 TB of client memory. The IBM z13s Model N20 is estimated to provide up to 100% more total system capacity than the IBM zEnterprise® BC12 Model H13. 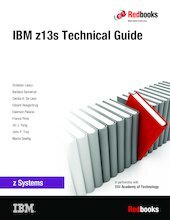 This book provides information about the IBM z13s server and its functions, features, and associated software support. Greater detail is offered in areas relevant to technical planning. It is intended for systems engineers, consultants, planners, and anyone who wants to understand the IBM z Systems™ functions and plan for their usage. It is not intended as an introduction to mainframes. Readers are expected to be generally familiar with existing IBM z Systems technology and terminology.